Now that spring training has officially kicked off, it's time for baseball writers to spend the next two months filling column space while absolutely nothing of consequence happens. Fox Sports' Ken Rosenthal got started today, asking various members of the San Francisco Giants to share their favorite offseason memory. The best answer came from the newly sophisticated-looking Tim Lincecum, who told Rosenthal that he spent a portion of the offseason in Mexico "just kind of finding an epiphany toward baseball." Lincecum likened the experience to, "Seeing a light that...opened up a whole bunch of exciting feelings in yourself that make the upcoming season right now more of an exclamation point than a question mark." "You're kind of just in touch with yourself, coming into contact with your weaknesses and accepting those weaknesses and knowing how to get out of them, how to work with them," he said. 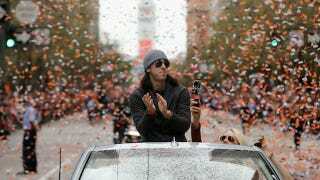 So it sounds like Lincecum had a really nice time smoking weed in Mexico.